Ovation Credit has provided services since 2004 and holds industry accreditations. They offer a wide range of removable items, personalized credit repair, and a money back guarantee. 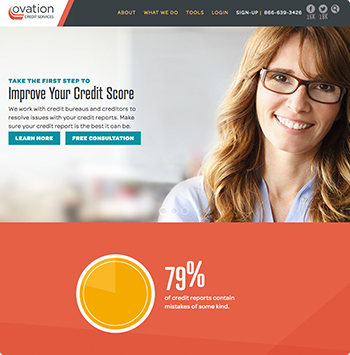 Since 2004, Ovation Credit has assisted over 100,000 people repair their credit scores. Ovation Credit provides TransUnion and Equifax credit reports while guiding you through obtaining your Experian report, which can be sent to them through email, fax, or post. They create an online account where you can be updated on the status of your credit reports and the changes in real time. Ovation is unique in that they have a reputation for excellent customer service, as evidenced by multiple rave reviews. In the case you are not satisfied with their service, it can be canceled anytime. There is a 100% monthly money back guarantee for any month in which they do not meet the services promised. One added bonus is the transparency of the website. Each program, the benefits, and even the members of the Ovation Credit team are laid out in an organized, easy to read format. In addition to credit repair, Ovation Credit offers services for identity theft resolution, goodwill letters, and 24/7 TransUnion Monitoring. Industry accreditations: Ovation Credit is accredited by the Better Business Bureau with an A+. Wide range of removable items: Ovation can remove collections, charge-offs, bankruptcies, foreclosure, and more from your credit report. Fast and legal service: The credit repair process is unique for everyone, but many of Ovation Credit's clients typically see results in around 30 to 45 days. After 6 to 8 months in the credit repair program, they will see an average of 19 removals. No cancellation fee: Customers can cancel service at any time without an extra fee. Money back guarantee: In the case you are not satisfied with the month’s work, there is a 100% monthly money back guarantee. Although there are many positive aspects of Ovation Credit, their first-time work fee and monthly plan for the Essentials Plus package are priced much higher than their competitors. They offer only one monthly payment option rather than a pay-per-deletion method. Ovation Credit offers a money back guarantee for each month that they “fail to provide the agreed-upon services.” They are also one of the few credit repair companies that offer the option of validation letters, recommendation letters, goodwill letters, and 24/7 TransUnion credit monitoring. Essentials Plan: For $59/month, this plan offers a credit analyst, person care advisors, online dispute management, and unlimited bureau disputes. Essentials Plus Plan: For $89/month, this plan includes everything in the Essentials Plan and the added benefits of unlimited validation letters, recommendation letters, unlimited goodwill letters, and 24/7 TransUnion credit monitoring. Customers have the option of adding Fast Track Same Day Service for a one time fee of $25 and Identity Optimization for a one time fee of $25. How does Ovation Credit compare to its competitors? Ovation Credit offers a 100% monthly money back guarantee in the case that there are no items removed. For an extra fee, they offer same day service and identity fraud prevention. Customers are also eligible for multiple credits and discounts. The Credit Repair Organizations Act (CROA) sets tough laws to ensure company compliance and protect consumer rights. For example, the CROA states that no credit repair organization can bill a customer until services are performed. However, many companies (including Ovation Credit) charge a setup fee or “first work fee” in order to acquire credit reports. A for-profit company must also accurately inform you of what they can and cannot do in addition to providing a written contract and allowing the contract to be canceled within three business days of signing. If you ask, a legitimate company will inform you that you have the right to fix your own credit. Companies that guarantee to erase bad credit or raise your credit score by a high amount very quickly is a red flag. Because Ovation Credit follows all of these rules, they are a lawful credit repair service.